I would like to know how to make the frame work for a mickey mouse head arch? I can't seem to figure out how to get the pvc attached to the base so that its rounded and sturdy. Also how would i attach the ears if on pvc? How many balloons did it take to make this arch? 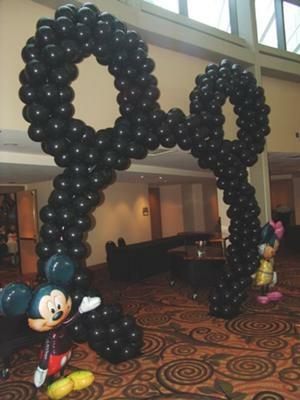 The number of balloons you need depends on the size of the Mickey Mouse balloon arch you're planning to make. You can calculate the length of the arch frame and the number of balloons with the formulas on this page. Hi, I am wanting to do a Minnie mouse balloon arch, how many balloons should I purchase to complete the project? The materials for the frame are mentioned throughout the comments on this page. I am planning on using pool noodles for the frame, $4.00 total and hot gluing them together and connecting the balloons with fishing line. I will let you know how it goes! I'm pretty crafty but this may be a challenge, then finally I will have to come up with a way to secure them to the floor...I'm up for suggestions! What materials are needed and how many balloons did you use? And will any pvc work ? This is my photo (and I am pleased to see it all over the internet). You do not need to bend the poles because it is made with flexible plain-end PVC Pipe over very heavy/wide metal bases which have 12 inch threaded rods. I hope this helps. How do you make this ? I saw measurements already but what materials are needed and approx. How many balloons, how do you get poles to bend? I would recommend using 7" or 9" balloons. From looking at the photo's background, I would say that the arch (without the ears), is about 7 to 8 feet high. To inflate balloons to the same size it is best to use a balloon sizer. I would not recommend doing the complete Mickey Mouse arch with helium filled balloons. The arch wouldn't be stable enough. As for breaking down the figure 2 formula for you... I am not quite sure what you mean. So if your arch should be 6ft tall and wide, the arch length wold be 9ft + 6ft = 15ft. The Mickey/Minnie arch can be done either with helium ears tied in or with a wire bent and air-filled for the ears twisted/tied in. I do this both ways. You can see the photos of the base/threaded conduit and pvc/emt pipe fittings on my FB page. The key to all structures is safety, so use heavy/wide bases for Mickey/Minnie. We made our ear arch frame using 2 x 20mm conduit stems fixed onto a wooden base then inserting garden canes inside to make it more rigid. Probably a little extreme but it worked for us...then 19mm conduit inside the top of these these giving us the arch...we used black gaffer tape to hold into place. So we then had our arch structure ...added air filled balloons then the ears we added helium filled clusters to monoline . They looked okay...but I'm sure I would have done better if they wasn't so big. Another reader, Nancy, had suggested to create the ears with helium filled balloons. You'd simply put the balloon clusters onto a fishing (monafilament) line and tie the line to the PVC frame. Judging by Nancy's photo on her website, this seems to work just as well as creating another sturdy frame for the ears. You can see the example of Nancy's Mickey Mouse arch here. Hello, I am making a minnie mouse balloon arch and have used your calculations & suggestions to come up with the PVC and number of balloons. You stated to use helium balloons for the ears.....how do you attach the ears to the PVC arch? Fingers crossed that your Mickey Mouse balloon arch and other themed designs will turn out fabulously! There are formulas to calculate the size of the arch and how many clusters of balloons you need. You'll find the length and height formula here. Then click on this link to find the formula for calculating the number of balloon clusters you need for your arch. what was the length and width of the arch to ensure you can fit your balloons properly? what kind of base did you use for the mickey mouse arch, did you use a wood block or a steel plate? I used a wood block & 1/2 inch pvc pipe attached to a flange on the wood block but it won't stand on its own just like yours. The bases are extra-heavy 50# and are 24" wide. In the plumbing department of Home Depot buy a flange, attach it to the base with threaded screws. The middle of the flange has a threaded 1" metal pipe 3'in length. This is the base. Insert into this base 1/4" pvc pipe. I make the ears with helium on filament line, and tie them in. The base of the arch and the bulk of the balloons are air-inflated to 9" and attached to the pvc pipe. It's a very popular design and simple to make. It is better to use mini-helium arches on top, thus eliminating any structural concerns. thank you so much i was thinking the same thing (i made a run to home depot) just wasnt sure if it would work or not. again thank you! I haven't done a Mickey Mouse balloon arch myself. But I found a neat tip over at BalloonHQ.com for making the frame. Use a three-way compression coupling, also called tee compression coupling, for the two bases. Insert the conduit into the opening that goes out in a 90 degree angle. Then bend the conduit into the round shape. That should help you in achieving a nice rounded arch shape at the bases. You could try the same method for the ears. Use the compression couplings at both ends of the ears (where they meet the arch). You might want to make the ears with 1/4 inch aluminium rod instead of PVC. The rod is easier to bend and the ears don't need to be as sturdy as the rest of the arch. Here are some images of tee compression couplings to illustrate what I mean. P.S. : I would love to see a photo of your balloon arch (it does not have to be from a wedding, pictures from birthday parties or other events are welcome too).